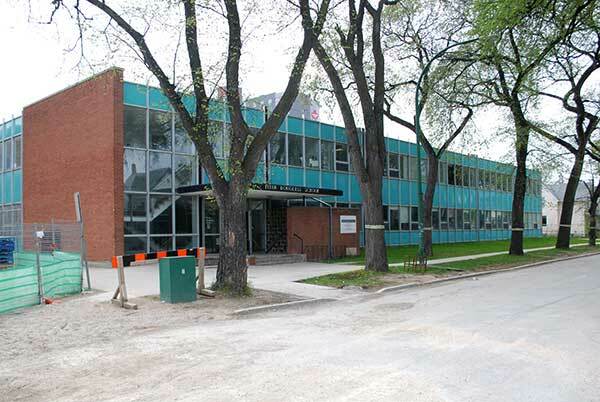 Constructed in 1960 and named for M. Ellen Douglass, this building housed a six-classroom school catering to the needs of disabled children and, on the second floor, the Child Guidance Clinic of Winnipeg. It was funded jointly by the Winnipeg School Division and the Manitoba Department of Health and Social Services. Designed by William Enns, an in-house architect for the Winnipeg School Division who also designed St. John’s High School and Kelvin High School. The building’s cornerstone was laid by Canadian Governor-General Georges Philias Vanier on 28 April 1960 and was opened officially on 20 January 1961. The school portion was closed in June 1980 and most of its students were relocated in September 1980 to Lord Roberts School. The main floor was then leased to the International Centre, primarily as ESL classrooms for new immigrants, before the building was taken over completely by the Child Guidance Clinic. By 2015, the clinic, now called Clinical Support Services, had vacated and the School Division put it up for sale. In February 2017, it was purchased by the Winnipeg Regional Health Authority. “Vanier to be asked to lay cornerstone of new city school,” Winnipeg Free Press, 7 April 1960, page 24. “Official ceremonies set for Vanier visit to city,” Winnipeg Free Press, 12 April 1960, page 3. “Vaniers wave goodbye,” Winnipeg Free Press, 28 April 1960, page 1. [Photo caption], Winnipeg Free Press, 25 February 1961, page 11. “The Winnipeg School Division No. 1,” Winnipeg Free Press, 13 January 1973, page 43. “Bembridge new Principal,” Winnipeg Free Press, 14 April 1973. “School’s goal - to make children independent,” Winnipeg Free Press, 8 December 1977, page 46. We thank the Winnipeg School Division for providing information used here. This page was prepared by Nathan Kramer, Christian Cassidy, and Gordon Goldsborough.